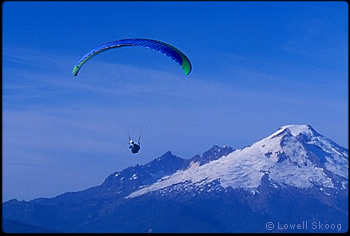 In July 1995, the paragliding clubs of Seattle, Spokane and Portland sponsored the U.S. National Paragliding Championships at Chelan Butte, organized by Bill Gordon and Joe Gluzinski. Prior to this time, Northwest clubs had been mostly concerned with local flying sites and safety. The Northwest Paragliding Club of Seattle devoted its attention to Tiger Mountain, a site originally established by hang glider pilots near Issaquah. Hosting the U.S. Nationals was an expression of Northwest pride and a way to bootstrap cross-country flying in Washington. Since Mark Shipman’s 1990 flight, the state distance record had been extended at Chelan twice, but cross-country flying there by paragliders was still quite rare. With top pilots from throughout the United States present, the competition went reasonably well, but several days were windy, with very rough flying. There was at least one reserve parachute deployment, several crashes and injuries, and many wild rides. Dave Kruglinski spun into the hill on Day 4 and suffered breaks in both legs. For Bruce Tracy, the Nationals reinforced his conviction that the best flying in Washington was not at Chelan but in his backyard, the Methow Valley of the northeastern Cascades. With Dave Kruglinski and others, Bruce began to explore the cross-country flying potential of his Cascade backyard. Bruce and Downwind Dave nursed dreams of epic flights originating in the Methow Valley. They flew the local sites as much as they could to hone their skills and explore what was possible. On April 17, 1997, Downwind Dave Kruglinski perished during one of these scouting flights. He launched at Bowen Mountain near Winthrop and flew southwest toward the Twisp River. No one witnessed his crash but his body was found the next day on Balky Hill after an apparent severe impact. Two months later, Bruce Tracy and Dave Verbois obtained permission from the Forest Service to cut a few trees along the Goat Peak road above Mazama. They opened a new launch there, dedicated to the memory of Downwind Dave. Bruce made several fine cross-country flights from this launch and strengthened his belief that this site, under the right conditions, would open the door to a dream he and Downwind Dave had shared. They imagined flying from Mazama west across the Cascade Crest, following the route of the North Cascades Highway. In August, while spending a day at Chelan Butte, Bruce described this dream to Mark Telep, an outstanding Oregon pilot. 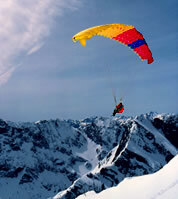 After the 1995 Nationals, paragliding at Chelan had come of age. (The U.S. Nationals were held there again in 1996.) Telep spent several weeks in 1997 flying full-time at Chelan, racking up 1000 cross-country miles and extending the state distance record several times. His longest flight was 120 miles, a state record that stood until 2013. On Bruce’s recommendation, Telep and friend Jay Carroll, experienced climbers as well as pilots, decided to check out flying in the Methow Valley. On August 11, just days after their conversation with Bruce, they caught exceptionally good conditions and completed his dream flight over the Cascade Crest. Launching at Goat Peak, they flew over Silver Star Mountain and Washington Pass, reaching altitudes over 13,000 feet, then followed the ridgeline northeast of Highway 20 to the Panther Creek parking lot near Ross Lake. Bruce Tracy was keenly disappointed to have missed this pioneering flight, heralded by pilots as the first paraglider crossing of the Cascades. Within a few years, similar flights were accomplished in other parts of the range. In May 2000, Ryan Swan launched near Cashmere and flew west to the Stevens Pass ski area. In August 2002, Fred Krusemark flew from Tiger Mountain east over Snoqualmie Pass to Lake Keechelus. Krusemark’s Snoqualmie Pass crossing was extended by Tom McCune and David Byrne in April 2005, with McCune making it all the way to Cle Elum. Tom McCune also made long flights along the Cascade foothills both north and south from Tiger Mountain. The era of amazing cross-country flights over the Cascades by paragliders had arrived. For Bruce Tracy, it was a long way from his first hops on a seven-cell glider on Thimble Mountain in 1987. As a mountaineer, Bruce knew that the North Cascades, “The American Alps,” were the scenic climax of the Cascade Range, far more spectacular than either Snoqualmie Pass or Stevens Pass. He also knew that Telep and Carroll’s 1997 crossing of the North Cascades Highway had been incomplete. They had crossed the Cascade Crest but essentially landed in the middle of the mountains. He nursed a new dream, to fly all the way across the North Cascades from Marblemount to Mazama. Two months later, on September 18, 2003, Bruce Tracy died while flying in the U.S. National Paragliding Championships at Telluride, CO. He was scratching for lift near the launch site on the first day, hit severe turbulence, and crashed to the ground. Fellow pilots landed and rushed to his aid, but he could not be revived. He was 55 years of age. Bruce Tracy was not at Telluride to win the contest, but to hone his skills in hope of someday realizing his dream back home in the Cascades. Anyone familiar with the North Cascades marvels at the audacity of flying cross-country over these mountains, with their ragged summits, crevassed glaciers, and cathedral forests. Yet anyone familiar with paragliding, as Bruce Tracy was, knows that amazing flights are being accomplished every year around the globe. Experience has shown that dreams like this have a way of coming true. When and if Bruce Tracy’s dream of paragliding across the North Cascades is finally realized, it will be a tribute to his singular vision. On June 4, 2016, six paraglider pilots launched from Sauk Mountain on the west side of the North Cascades near the town of Rockport. Evan Bouchier, Noah Briller, David Milroy and Matt Senior flew as a group, while Joshua Hockett and Roy Morris flew independently. Climbing in thermals high above Sauk, they crossed the Skagit River near Marblemount and found lift along the ridgeline north of the Cascade River. They followed this ridge past some of the giants of the North Cascades: Eldorado Peak, Forbidden Peak, Buckner Mountain, Mount Goode, and more. Gliding across the North Fork of Bridge Creek, they rode thermals over Rainy and Washington Passes to Silver Star Mountain, then flew past Sandy Butte to land in open fields near Mazama. The flight took five hours. The dream of paragliding across the North Cascades had been realized. This achievement followed a series of increasingly adventurous flights throughout the Cascades north of Snoqualmie Pass (see chronology). Remarkably, the Rockport to Mazama crossing was repeated the very next day by Bill Morris. Commenting on a June 5, 2016 Facebook post by Joshua Hockett, Matt Senior wrote, "In five years it will be a milk run...a very scenic one." Chelan, WA, state record (24 miles). Chelan, WA, state record (49 miles). Chelan, WA, state record (65 miles). Chelan, WA, state record (120 miles). From Mazama over Rainy Pass to Ross Lake. From Cashmere to Stevens Pass. From Tiger Mountain east over Snoqualmie Pass to Hyak. From Leavenworth over the Stuart Range to Cle Elum. From Chelan Butte to Mazama via the Sawtooth Mountains. From Tiger Mountain north to Blanchard. Chelan, WA, state record (155 miles). Chelan, WA, state record (179 miles). From Rampart Ridge to Leavenworth over the Alpine Lakes Wilderness. From Leavenworth to Mazama along the east flank of the Cascade Crest. From Rockport to Mazama across the North Cascades. 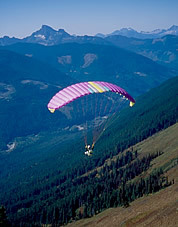 A more extensive chronology of early Northwest paragliding can be found on alpenglow.org.